Call our friendly Sale Staff and place that order. We can take your order over the phone. We have tons of products to pick from. We can also deliver you products to your site or home depending on size and destination. Come on by and talk to our sales staff to help with all your building needs. An remember, coffee is always hot so come on down and take a look around. 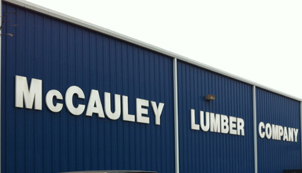 McCauley's Lumber Company is an old fashion store with down home people. For the best price and best service McCauley's is the place to be. We may be off the beaten path but were worth the Trip.